Unmatched in quality and capacity at this price! 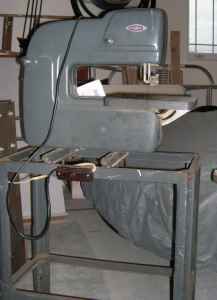 This Craftsman 3 wheel band saw was popular machine in the Craftsman line in the early 1950's and 60's. Extremely accurate -- cuts as thin as 20/1000 of an inch. Much more compact design than conventional 2-wheel saws of this capacity. Has "super-alloy" blade, the result of years of research. Ideal for home craftsman, woodworking, and wood pattern shops. Recommended for wood cutting only (Not recommended for metal cutting). All working parts, except blade cutting edge, are fully enclosed for extra reinforced cast iron frame. Double-row precision ball bearings mounted integrally with drive shaft, assuring perfect alignment and smooth operation. Double row Torrington needle bearings on idler wheels. Rubber tires, ground true... wheels machined to close limits to assure concentricity. 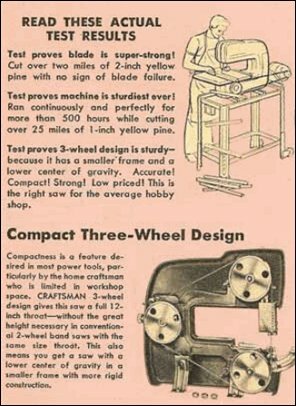 The Craftsman 3 wheel band saw cut to the center of a 24-inch circle. 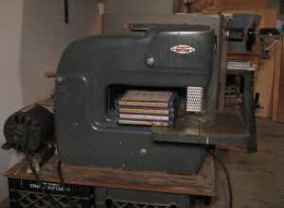 It made curved or irregular cuts in wood up to 4 inches thick. It was the only saw we know of with such a low center of gravity, and a full 12-inch throat, 12 x 12 inch table mounted on double trunnions, with 4 points of support instead of 2, for greater rigidity; tlts 0 to 45 degrees; has a tilt indicator. Proper blade tension determined by built-in reading scale. One 1/4 x 62 inch blade included. Bearings... 2 sets, lubricated for life, precision ball bearing. Motor recommended 1/4 H.P. 1750 R.P.M.